How quickly things change in the world of wine. What was new becomes old, and what was old becomes new again. Like Malbec, for instance. I've told this story before: Malbec, originally a prized partner in the French Bordeaux blend, fell out of favor in the old country in modern times, but it became a trademark grape in New World Argentina, where wine makers - many of Italian heritage - used Malbec in earthy, robust table wines from beautiful Mendoza on the slopes of the Andes. Malbec, almost alone in its market niche, isn't only about fruit. Although its fruit is usually forward and easy to enjoy, it almost offers a pleasant earthiness, a hint of clean, moist clay that suggests a sense of place in a distinctly Old World way. If you find it hard to visualize a desirable aroma or flavor component in wine that's reminiscent of mud, let's consider an analogy that, for me, helps explain minerality in wine: We recently endured a 39-day late-summer drought in these parts, a dry spell that finally ended with long and heavy rains last week. Now, think about walking outdoors after such a drought-breaking rain, and watch the clean runoff water trickling down over hard-baked clay and dusty limestone. Take a deep breath. Remember that fresh, aromatic, earthy smell? When I pick up an aroma like that in wine, it pleases me in a deep and compelling fashion that's much more emotional than rational and that takes me back a very long way. This scent of the earth makes an appealing adjunct to simple fruit, and I consistently find it in Malbec. So what's a lover of old-school Malbec to do? 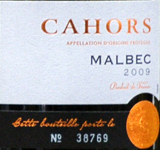 The other day, shopping for wine at Trader Joe's, I ran into one happy option: Cahors, the Southwestern French wine region not far from Bordeaux, is one place where Malbec (sometimes called "Auxerrois" in this area) is an ancient tradition that has not lost respect. While even Cahors has evolved a bit over the centuries, showing a bit more finesse than the old style nicknamed "Black Wine of Cahors," it generally remains true to the variety and a capable partner at the dinner table. J.P. Chenet 2009 Cahors Malbec ($10.99) proved a good example at a fair price. You'll find my tasting notes below, along with a Wine-Searcher.com link to more than 200 Cahors for those who want other options or simply don't have a Trader Joe's nearby. FOOD MATCH: A wine made for red meat - Argentine grilled parrilla steaks are classic - it worked well with lightly spiced cevapcici, Bosnian style burgers. WHEN TO DRINK: Good balance and the Malbec variety should ensure graceful aging, but the tiny, synthetic stopper does not generate confidence. Based on sad experience with this type closure, I'd recommend drinking up within the next year or two. VALUE: The price near $10 is entirely fair for this good table red. It appears that this Malbec is available exclusively at Trader Joe's stores, but you might browse Wine-Searcher.com link for other affordable varietal wines from J.P. Chenet. WEB LINK: Here's a link to J.P. Chenet, a large French wine-export firm known for its modestly priced wine in odd, stubby bottles. Trader Joe's appears to be the only source of J.P. Chenet Malbec in the U.S. Check your local shop for availability. Other affordable J.P. Chenet varietal wines are available, though. 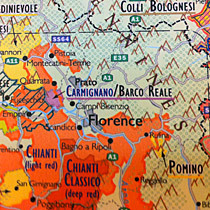 Use this Wine-Searcher.com link to find them. Or you can browse more than 200 Cahors from other producers on Wine-Searcher.com.